Well, almost. But with shorts and swimsuits looming in your not too distant future, it's time to dust off your News Year's plans to eat better and chef up these delicious sandwiches to help you get there. I find that lunch can be the hardest meal of the day to get inspired over. It's easy to fall into the same old ruts, or even worse, reach for take-out or visit the office vending machine and call it a meal. Here are some of my spring faves that you can dig into guilt-free, knowing you're doing your body good, while keeping your planet's future in mind. Packed with healthy ingredients, protein, fiber for staying power (a key for weight loss), and an array of veggies to boost your nutrition quotient, each recipe is sublime and will keep you on your path to lean and green cuisine. In my recent EarthGrains Facebook fan page post (full disclosure, I am a paid spokesperson for them), I shared several other delicious recipes, one of which was for an egg salad recipe. But here's another option, especially if you are limiting your weekly egg count. .
Make this super-tasty eco-conscious sandwich filler in no time. This recipe is perfect for packing grab-and-go lunches or for lounging around at home. The nutritional yeast adds flavor, but also provides a rich source of protein and vitamin B12, so it's best not to omit. EarthGrains bread is 100% whole grain and has no artificial colors, flavors or preservatives-which I love- plus 20% of the grain is Eco-Grain™ - a wheat grown using innovative farming techniques that help reduce the amount of pesticides, energy and carbon emissions associated with production. In a medium bowl, mix together the mayo through the dill until well combined. Add tofu and gently fold into mixture. Taste and season with salt and pepper. Scoop 1 cup eggless egg salad on EarthGrains bread made with Eco-Grain wheat and top with veggies. Tuna is one of the most careful choices you have to make at the supermarket, as there are concerns about sustainable fisheries management and mercury contamination (to get the latest, download the latest copy of your region's Sustainable Seafood Guide). So what's the best choice for your tasty tuna sandwich? Look for albacore or skipjack tuna that is, "Marine Stewardship Certified" for a winning lean and green overlap. This certification confirms the tuna is caught in a sustainable fashion (using the troll or pole and line method). Artichokes make this filling feel extra creamy, and really kick this sandwich up a notch in taste. 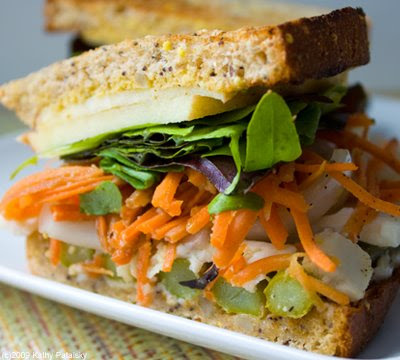 This sandwich powers you up with protein, slimming whole grains and heart healthy fats. What's not to love? In a medium bowl combine tuna through artichoke hearts. Fold in the mayo and the lemon juice. Add a bit more mayo or olive oil if needed. Taste and adjust seasoning with salt and pepper. There are loads of veggie burgers in the freezer aisle these days, so beware of the "health halo" that some not-so-healthy ones carry. Many now have super long lists that you need a magnifying glass to decipher- look for products made with 5 ingredients or less. I am a big fan of Sunshine burgers, which I discovered at the ADA Expo last year. Aside from being vegan and organic (both great for the planet), they have a super clean ingredient list, and are also soy, dairy, wheat and gluten-free. A pretty tall order for a burger-and you will be amazed at how delish they are! And it's a perfect final destination for any leftover caramelized onion you may have. Warm veggie burger according to package directions. Spread mayo or mustard on pita, tuck in the burger and remaining ingredients. This fresh take on what can seem ho-hum leftovers, is filled with protein to help satisfy you all afternoon. The zingy combo of veggies, cilantro, and lime is a refreshing change for spring. *Make one yourself by whisking together 1/4 c. rice vinegar, 3 Tbsp all natural peanut butter, 2 Tbsp brown sugar, 1 Tbsp soy sauce, 1 tsp fresh lime juice and 1/4 tsp chili garlic paste, or to taste. Combine chicken through green onion in a small bowl. Top wrap with mixture and roll up. My intern, Lindsey Toth, turned me on to this fantastic tower of goodness. It has grilled sweet potato rounds, caramelized onions, bean sprouts, and cilantro hummus (or any type of hummus you like). It is to die for! If you make the sweet potato ahead of time and then just briefly warm on the stove before assembling, this hot and hearty sandwich is super quick. Feel free to add your own favorite veggie fixings too. Heat grill over medium. Brush sweet potato slices with olive oil and grill over medium high heat until cooked through, about 5-8 minutes per side. Spread each side of toasted bun with 1 Tbsp hummus. Layer on sprouts, onions, and grilled sweet potato. Got other faves to help you shed pounds for spring? I'd love to hear about them.